The Test of Strength ..
You can start training for weight pull from the day your puppy wears its first harness, all you need to do is attach something small & light to the back of it so it drags along the floor while you are out walking. This gets them used to the noise & feel of something dragging along behind them. 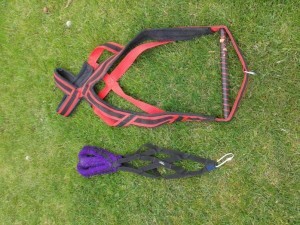 Most people will buy a X back harness for the first harness & subsequent. These are used for working on the rigs/sleds/scooters so one of these to begin with is ideal. A weight pull harness is slightly different in that it has a spreader bar across the back. This is to assist in distributing the weight more effectively. You will also notice the difference between the 2 harnesses when you see them on a dog. The Weight pull harness comes lower along the side of the legs & with the spreader bar it makes the point at which it pulls be behind the dog, where a X back harness will stop at the top of the dog. I would not advise buying a weight pull harness until you are sure your dog enjoys it. The organised events in the UK do normally have the opportunity to borrow harnesses while you are starting out with the competing. As they get older the weight of what you can pull behind them can increase, we have used tyres in the past, you do get some funny looks, but once they are 12 months old I would change this so that someone holds the dog & you go a little distance away & encourage them to come to your call towards you, almost like doing any obedience recall but you don’t want them to run to you. If you have also been going to obedience classes then your basic recall that you have been teaching from a very young puppy will stand you in good stead for Weight Pull. Try not to get the dog too excited so they bounce around, the ideal position for pulling is low to the ground so they pull from the front & don’t damage their back. The best way is be in a crouch position yourself & try & get them used to the words Pull. For novices you can have a long line, like a horse lunging line that you hold to encourage them towards you, personally I prefer not to, I prefer to start as you mean to og on & in competition your couldn’t do it. You can also enlist the help of someone & once they get used to coming towards you, you can then ask the handler to apply a little resistance to the pull so they feel it & pull against it to come to you. When you go to a weight pull event, they are timed at the pull. They will have 1 minute to pull the weight over 16 feet. So at home you can begin to build to that distance, so ideally the Handler lets them go & then they come to you to over the same distance. Once your dog has been called to the “on deck” are you will give them to the handler. You then take the lead with you to the other end. 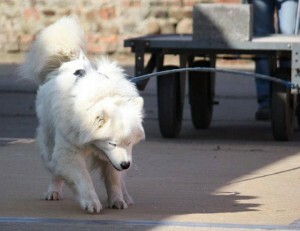 You are then told the pull has started & that is your time to encourage the dog to pull the weight & the trolley. 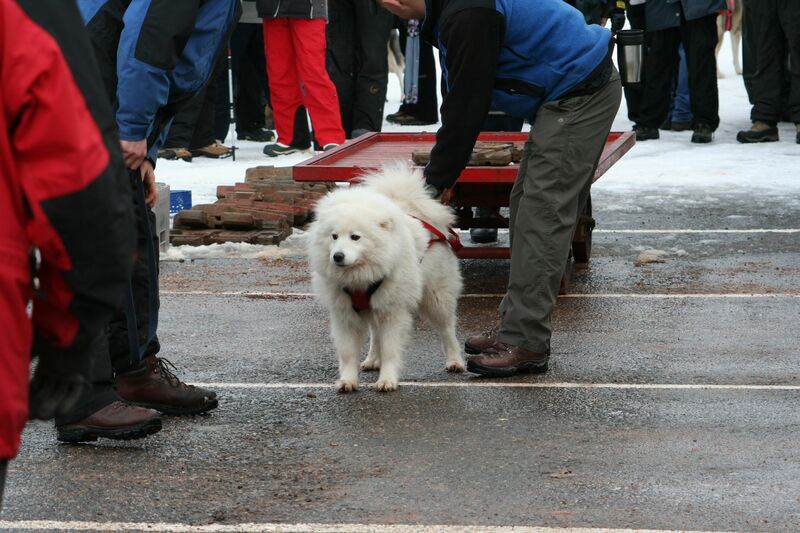 Each dog in the competition will take its turn pulling the same weight, you can choose to skip a turn as well but you will only find out if that works for your dog the more you do the competitions. If your dog appears to be struggling or stops pulling, you can then ask for the trolley to be pushed through behind them while you encourage them to pull. That way they are not just taken off without completing the distance & then learn not to pull. Once you are away from the pull area you are allowed to reward your dog. Most events also have a novice class. These are great for starting out as you do not have to leave the dog & can use a lot more encouragement, even being up close to them, however, my personal choice is not to use bait until they return to the van so when you move into proper classes it is easier to get them to pull as your are not allowed bait near them then at all. Apart from training with lighter weights, such as tyres, I would not advise doing any further weights with your dog unless you are at an organised event or are with people who have been doing this for a long time, you can easily damage your dog! The Alaskan Malamute Club of the United Kingdom run Weight pull events at Allerton Park in the North & Eastleigh in the South. Details can be found on their website http://www.alaskanmalamute.org.uk/index.htm by going to Working Information & selecting the information you are looking for. 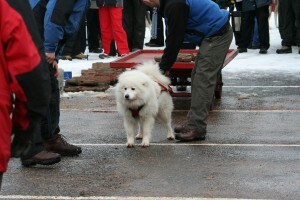 The most important bit – Any event you do with your dog should be fun! If you train them correctly they will want to pull & will enjoy it & you will too!